The quality of that version is not so good. (see below 18th November 2015 instagram post). Prince band in late October 2015. Paisley Park After Dark Poster. which has never been published. social media banner in Summer 2016. 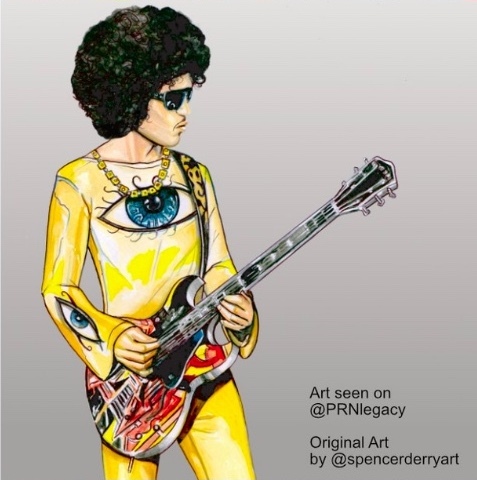 Prince wore an illustration, illustrated by me on his tunic with a single eye on the front. Originally I made the artwork as a portrait. The team increased it in size to show the eye on front and a finger 'Shhh' on the back. It is different to the Free Urself Art illustration which was also created by me. (2nd show) at the last 3rdeyegirl Concert on June 14th 2015.
on the 1st photo worn by Prince. All Rights Reserved Spencer J. Derry.